​The Suzuki method is often referred to as the Mother Tongue Approach. In the Suzuki method we teach music the same way we "teach" language. Just as we learn to speak our mother tongue well before we can read or write, students in the Suzuki method also learn to play music and develop a level of instrumental competence before they read music on the instrument. Just as a baby is surrounded by language, so must the Suzuki student be immersed in the music they will study. The student listens daily to a recording of the pieces they are learning. The parent plays a crucial role in this process and actually forms one third of the triangle between child, teacher and parent. Since young children are incapable of making long term commitments, it is the parent's responsibility to make the commitment on behalf of the child. When a child begins lessons the parent is committing to regular attendance and note-taking at lessons, daily practice with the child, and daily listening to the recorded music. 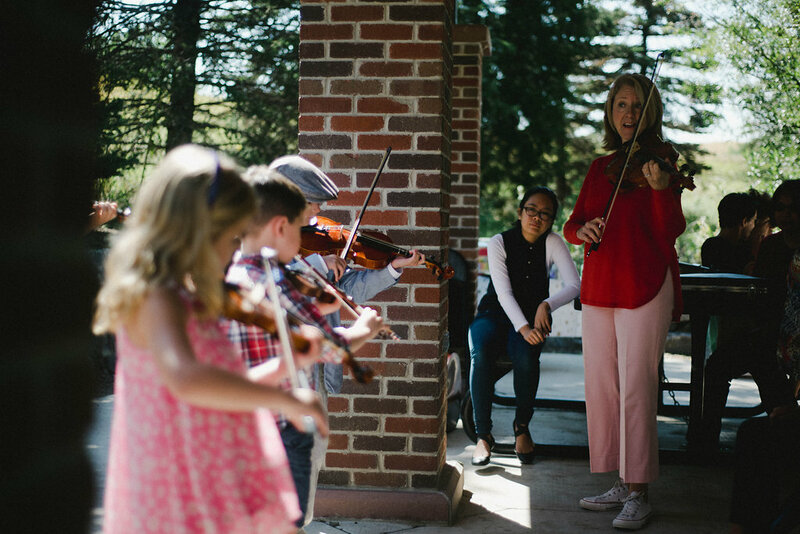 Group lessons are vital part of The Suzuki Method. Children learn to play in an ensemble, they get a chance to play review pieces in a fun way, they learn from their peers, they get to practice group pieces that supplement their solo Suzuki pieces and the teacher can cover additional learning concepts that lend themselves better to group settings. Read more about the Suzuki Method.